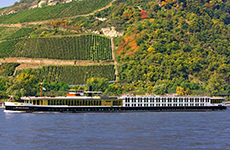 Los Angeles-based Uniworld Boutique River Cruise Collection is the premier river cruise company. Uniworld features intimate, elegant, boutique-hotel style cruise ships with an average capacity of 134 guests, an award-winning staff (voted #1 River Cruise Line in 2016 by Travel + Leisure) with a ratio of one staff member to every three guests, world-class cuisine, and expertly planned itineraries with custom-blended shore excursions. Uniworld offers over 500 departures on more than 40 itineraries, sailing on 23 rivers in over 24 countries throughout Europe, Russia, China, Egypt, Vietnam & Cambodia. Uniworld is also owned by the Travel Corporation, one of the largest travel companies in the world, which also includes Insight Vacation, Red Carnation Hotel Collection, Trafalgar, African Travel, Contiki and many more.